Continuing our WYHA? (Would you have appealed?) series of decisions, here's another one to consider for inclusion. The Board affirmed a Section 2(d) refusal to register the mark BOYD'S for various items of wearing apparel "offered and sold through authorized dealers," finding the mark likely to cause confusion with the registered mark BOYDS for men's and women's clothing and for related retail services. In re Boyd Coddington’s Hot Rods & Collectibles, Inc., Serial No. 78913114 (August 28, 2008) [not precedential]. There wasn't much room for disagreement about the similarity of the marks; that factor weighed "heavily" in favor of a likelihood of confusion finding. Likewise, the "similarity and nature of the goods and services" favored such a finding. So what was left to argue about? Not much. The Board had two major problems with Applicant's restriction argument: first, the restriction "does not specify a distinct channel of trade" (e.g., hot rod dealers), and so the authorized dealers may be clothing retailers who compete with the registrant. Second, as the Board observed in a footnote, even if there such a narrower restriction had been included, there is still no restriction on registrant's channels of trade, which could include, for example, hot rod dealers. The Board therefore concluded that the channels of trade must be considered similar, and in light of the "essentially identical" marks and the similar goods and services, it affirmed the 2(d) refusal. 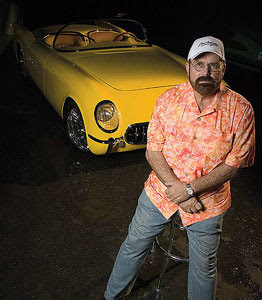 TTABlog note: The late Boyd Coddington, I have learned, was a famous hot rod designer and the star of the television show American Hot Rod.